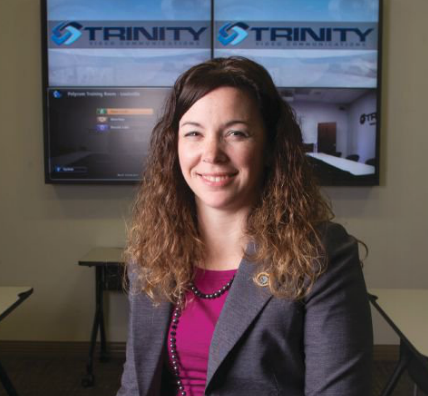 In the February 2015 issue of Commercial Integrator (CI), a publication dedicated to the business happenings of Professional Integrators whom serve the small and midsize business (SMB) market, Trinity Video’s Julie Kolb, Assistant VP of Administration and Chief Security Officer, was highlighted as an Unsung Hero for her efforts and dedication to the Professional Integration industry. Since beginning with the company in 1999, she has gained the respect of business partners and the reputation as a “go-to” person within her organization. “Julie represents an outstanding group of unsung heroes in USAV’s dealer member companies, and, I suspect, in every successful pro AV integration company,” said USAV Group CEO K.C. Schwarz, whom regularly works with Kolb and nominated her for the honor. “I can’t say enough about Julie’s value to the company,” said Barry Sawayer, CEO at Trinity Video Communications. “Julie is an incredible multi-tasker. No matter how much is given to her, she has it completed well before anyone’s expectation. Her communication skills with customers, peers and employees have made her the “go-to” person in the company,” said Sawayer. To read the full article, visit http://digital.commercialintegrator.com/publication/?i=242825&p=66. Trinity Video Communications is an audiovisual and video communications company that provides large corporations and healthcare organizations with state-of-the-art technologies that transform the way they communicate, interact and do business. Trinity Video also provides real-time unified communications to government agencies including the Department of Justice, Department of Defense, Homeland Security and law enforcement agencies at the federal, state and local levels responsible for mission critical initiatives. Trinity Video is headquartered in Louisville, Kentucky with additional offices in Sterling, Virginia and Cincinnati, Ohio. For more information, contact a Trinity Video Communications representative at 1-800-261-9008.